If you’ve never heard of the credit card float, it might sound relatively innocuous. Beach balls float. Clouds float. I mean, ice cream—one of the most beloved desserts out there—floats. And doesn’t everyone use credit cards, these days? How bad could a credit card float really be? Well, let’s take a look. A credit card float has all of the ingredients that you need for sweet, slightly fizzy, financial success … it’s just that they’re in the completely wrong order (which sets you up for extremely unfavorable results). Allocate cash to pay the credit card bill. Give every dollar a job (including that credit card payment). As you can see, the difference between these two scenarios is the timing of your spending. For best results, you definitely want to incorporate your spending into the mix last. So, let’s say that in January you use your credit card to pay for all of the things—bills, food, transportation, several coffee runs and perhaps even a pedicure. No big deal, because you’ll pay it off in February, right? So, February arrives, along with a new paycheck. You pay off your credit card, as you’d planned. Hooray! … but then, of course, you need to pay for all of the things for February. After making that payment, you’re out of cash, so back to the credit card you go! You charge all of the things for February. No big deal, because you’ll pay it off in March, right? See where this is going? You’re trapped! Your income is lagging a month behind your expenses, and you’re stuck floating on your credit card to make ends meet. As every successful YNABer knows, you want to be at least a month ahead of your expenses. If you’re lagging a month behind, your income isn’t even in step with your expenses! And, that’s a risky place to be. When you’re riding the credit card float, you’re forced to juggle your bills and expenses as you wait for your next paycheck. It’s stressful, because they don’t always line up perfectly. You’re likely to incur late fees. Vacation seems like an impossibility. And, what on earth will you do when an emergency expense pops up? You’re just spread way too thin. Are You Riding the Float? If you’re feeling queasy because this all sounds a little too familiar, here’s a question to help you determine if you are, indeed, floating: Can you pay your credit card, in full, right now and cover your current obligations? If you’re a “no,” then you’re likely floating. But don’t let that sink your spirits. This is fixable, and the solution is simple: First, recognize that you’re carrying debt. In fact, you’re dependent on it. Second, you need to move your spending (like we talked about, above). In other words, before you spend your money, you must give every dollar a job! Stop paying your credit card in full. Use your money to cover all of your current obligations, including the minimum payment to your credit card. Use any leftover money to pay off your credit card debt. If you’d like a more in-depth look at how this works, drop into our free, 20-minute, online class, Create a Debt Paydown Plan. Our teachers alway save time at the end to answer your questions. Imagine having at least a month’s worth of paychecks sitting in the bank, before the month even starts. It’s February, and you’ve got everything, and I mean everything, covered through the end of March. Money worries are a thing of the past. When a bill arrives, you simply pay it. Or, even better, you’ve got all of your bills on autopay. You’ve stopped feeling anxious about the day-to-day, and you’re looking for smarter ways to get ahead (investing!). You’re also planning more fun, like finally taking that big vacation you’ve been dreaming about for years. You’re in total control of your money. It doesn’t mean you don’t use your credit card—maybe you get great air miles. … the difference is that you’re no longer vulnerable. You’re no longer relying on future income to pay off debt. The future is never guaranteed, so you’re doing it the smart way: you get paid before you use the card. You know that when the bill arrives, and you’ve got the cash to pay it. And, that’s what we call financial freedom. 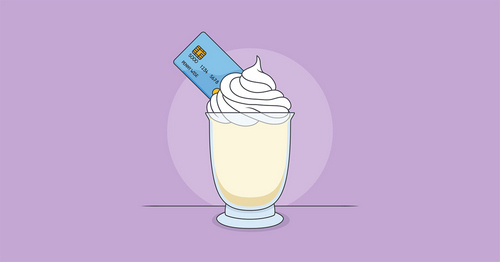 So, YNABer, is the sickly-sweet taste of the credit card float a little too rich for your paycheck? Work your plan, and save those bucks! Where will you cut back? Let us know, and keep us posted on how much you save by posting on social with #escapethefloatwithynab.